I need a Mauser fix. Thank you in advance. You didn't say original or sporter so here's my 1916 Oviedo 30-30 Win sporter. One of tbe funnest guns I own. I'll try to take a photo of my Turk Small ring barrel threading and large-ring receiver this week. Its in .308 Win with target sights and a Wilson stainless barrel installed. Its a small ring barrel/large ring action. A 24/47 is not a Small Ring Mauser. But the action screws are the same spacing as most Small Ring mausers. Some Small ring stocks can be inletted for the Yugos, but most are too narrow for the larger receiver ring. I also have an as issued Mexican Mauser 1910 and an as issued 1916 Oviedo Spanish Mauser along with several actions of each for projects. Only have one, a 1891 made by Loewe in 1893. Was sporterized when I got it and someone had put a pitted barrel from a carcano on it. Made a reamer and machined a 44 blank to octagon to make an early-ish looking hunting rifle. Still need to rust blue the barrel but it's been out hunting. And your cartridge is a '06 case for .430" bullets or somesuch? What neat guns! Husqvarna Model 46. 9.3x57mm Altered for scope. Those Husky 9.3's are so nice! I've yet to own an 1891 Mauser. I sure want one. I love all Mausers. Thanks for sharing pictures. Keep them coming. 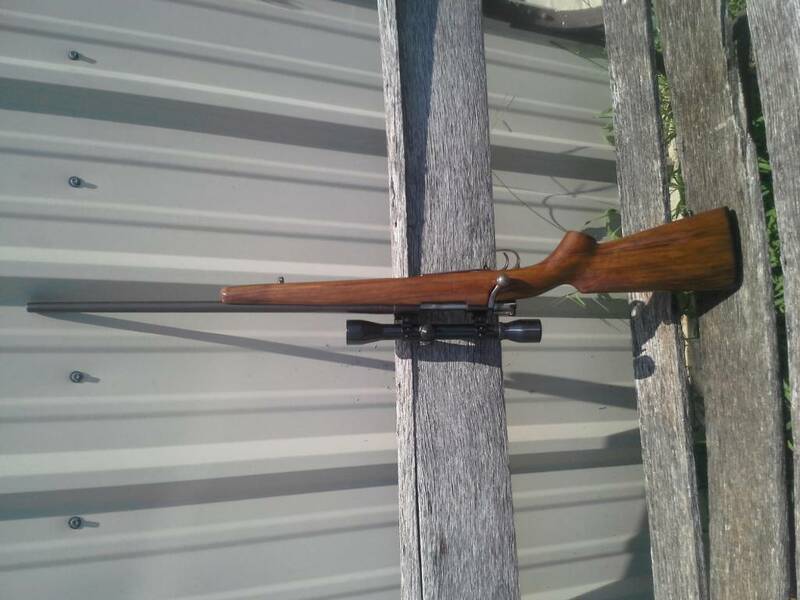 Wow TBG, with all the firearms you have you never had a 91 Mauser!!! You had better get on the ball and pick one up. They are nice Mauser and generally very well finished too!